The Olympics are known for their strict guidelines and regulations, even when it comes to matters of physical appearance. So, are Olympians allowed to have piercings? It seems that the answer is yes — within reason, of course. If you take a look at photos from the the 2012 Summer Olympic Games, you'll actually see that quite a few of the athletes are sporting piercings — though the adornments tend to be limited to simple stud earrings, as opposed to wilder dermal piercings or large hoops (which certainly makes sense, safety-wise). I'd imagine that piercings are allowed, as long as they don't pose a safety risk. In general in athletics (and most especially contact sports), hoops are a no-no, since they can get caught on something, tearing the skin. Keeping things distraction-free is likely another priority — can you imagine competing on the uneven bars while long, dangly earrings spin around your face? Still, though, there's room for athletes to customize their look with simple jewelry if they so choose. Headline-making gymnast Simone Biles has been known to sport studs during competitions — and that likely won't change in the upcoming Rio Games. This will be her first Olympics, but she's nabbed an impressive four world championships in a row. 2012 Olympian gymnast (and recently-crowned 2016 teammate) Aly Raisman also wore sparkly studs to go with her even sparklier American flag-emblazoned leotard during her gold medal-winning floor routine to "Hava Nagila." 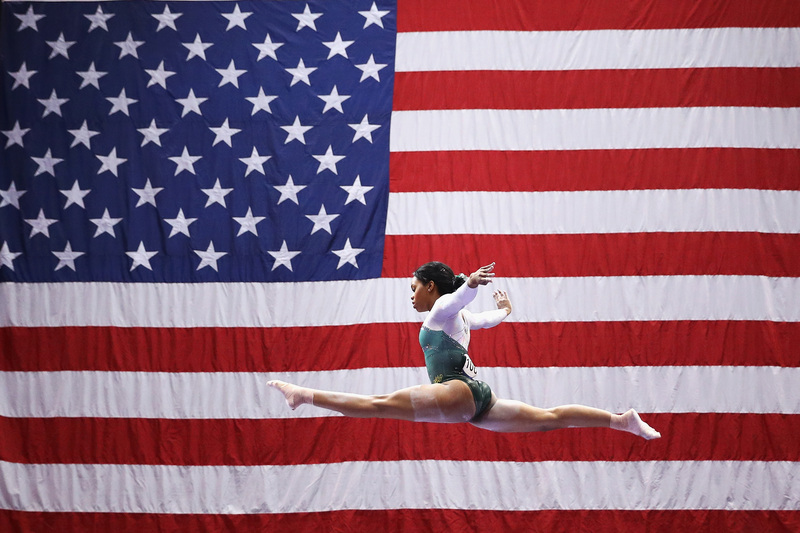 The rest of the new team (with the exception of Gabby Douglas, who tends to compete sans earrings) also seems to have a preference for simple studs, to go with their trademark pulled-back hair and shiny leotards (and, of course, their team warm-up sweats and patriotic hair ribbons). Gymnastics isn't the only sport to wear piercings — earrings aren't necessarily popular with all the other disciplines the way they are with gymnastics, but you will find them with beach volleyball, perhaps most notably with 2012's champions, Misty May-Treanor and Kerri Walsh Jennings. It would seem that there's definitely a place for pierced ears within the complex Olympian infrastructure — you just might want to leave your dangly bellybutton piercings at home, though!